Everything you need to put on an incredible show is inside this box! Using the special formula and tool provided with this kit, you will learn how to make Bubble Chains, Bubble Cubes, Bubble inside Bubble and more! Uncle Bubble formulas and tool are used by Bubble Performers around the world. You will learn the secrets of Bubble Mastery. 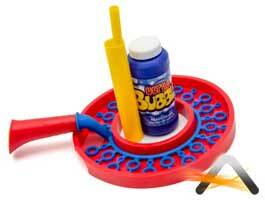 Please note that bubble wand and dipping tray colours may vary.